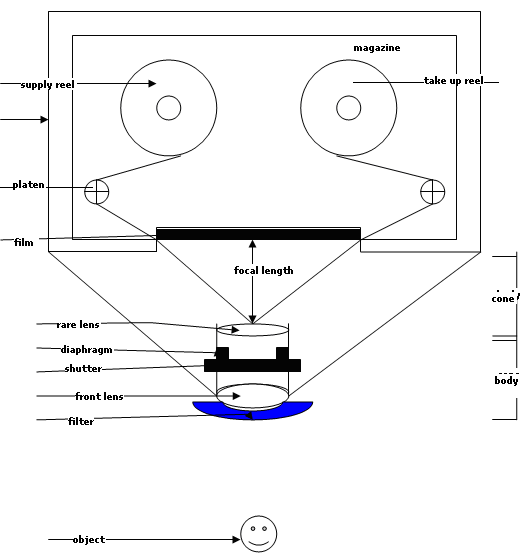 Describe the various parts of an Aerial Camera; their types and functions. A Camera is a device used for taking photographs by letting light from an image fall briefly onto sensitized film, usually by means of a lens-and-shutter mechanism. An aerial camera is a camera which is specially designed for use in an aerial vehicle/ aircraft. The cone is intermediate part of the camera which keeps the camera body and magazine at a definite distance apart from each other. When the camera is focused at infinity, the lens gathers light rays reflected from the objects and transmits them in an orderly fashion to the light-sensitive areas known as the film. The shutter serves to regulate the amount and duration of light reaching the film when making an exposure and it has a millimeter opening which overcomes the jerks and blurring caused by the moving aircraft and to capture the whole picture. In addition to a fast and effective shutter, the camera should have a high-grade lens which should admit sufficient light at the required shutter speed and must be adaptable to the particular camera design and the film used and should have low distortion characteristics. There are various types of aerial cameras but the most commonly used are single lens camera. By lens type: single lens, multiple lenses. By angular field: normal angle up to 75; wide angle 750 to 100; and, super wide angle 100 and above. By focal length: short up to 6 inches; normal 6 to 12 inches; and, long more than 12 inches. The selection of any camera would depend upon the need and use. For instance, the cameras used for low altitude high-speed photography must have wide angle lenses, fast shutter, image motion compensation magazines and short cycle times. On the other hand, for higher altitude photography long-focal length cameras are used to provide a reasonable scale and resolution. Commonly used cameras are Zeiss EMKA 15/23 and Wild RC-8. These work on both panchromatic and colored films. Other include Metric camera (having no focusing), Stereometric camera (with focusing), and Armature camera (used for less accuracy). The focal length of the camera should be normally 6, 8.25, or 12 inches. The camera should expose 9 ´ 9-inch image negatives; the focal plane and fiducial marks be permanently fixed on the photographs. The platen against which the film is pressed at the time of exposure should not depart by more than ± 0.0005 inches. The radial distortion should normally not exceed ± 0.003mm out to 30O and ±0.10 mm at 35O.